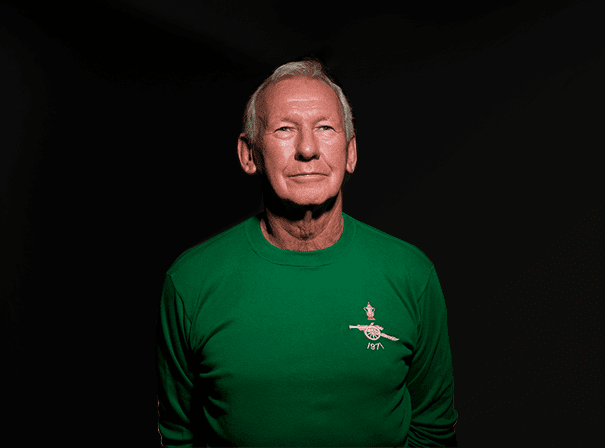 Former Scottish international Soccerer Bob Wilson is a very recognisable personality who has dedicated large swathes of his time to charitable causes. Bob is a fascinating public speaker and great character to have hosting charity dinners or presenting sports awards. As a youth, Bob actually captained the Derbyshire Juniors Cricket Team and got into Soccer comparatively late. His father stopped him from signing for Manchester United as he thought it wasn’t a reasonable job whilst he was a youth and instead he made his debut for Arsenal. Before long he became a firm fixture with the team and went on to play for them for his whole career, notching up 234 games and keeping 125 clean sheets in that time. With Arsenal he won the First Division, FA Cup and Inter-Cities Fairs Cup and spent a lot of time after coaching the team. Following the sad death of his daughter from cancer, Bob set up The “Willow Foundation” in her memory in 1999 and it has since grown to have national remit and now helps the estimated 12,500 people in the UK, aged 16-40, who are diagnosed every year with a life-threatening illness. For his services to charity Bob was honoured with an Order of the British Empire in 2007. As such, should you be looking to have an inspirational figure, philanthropic personality or motivational speaker come and add some excitement to your event, Bob Wilson makes a perfect choice.